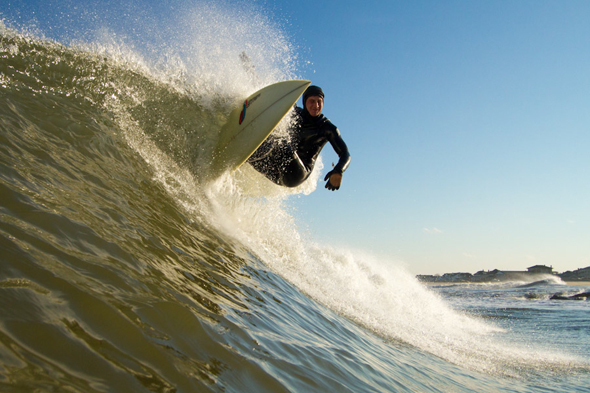 The winter of 2013 has been near epic for surfers here in New Jersey. Graced with numerous overhead, thunderous barreling days, we have a stockpile of mental tube shots to last us well into hurricane season. But we won’t be waiting till August for more solid waves. Spring is one of my favorite times of year for surfing and with more swell on the horizon for early next week, I’m hoping for a promising Spring as the temperatures slowly elevate. 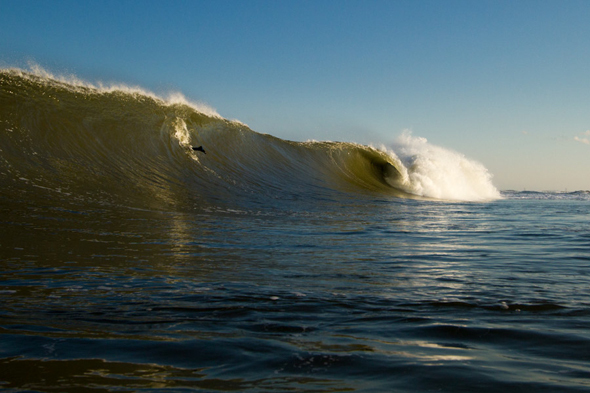 The final swell of the season came with perfect timing, hitting us on March 19th, the “official” last day of winter. Another day of overhead grinding tubes, offshore winds, nasty inside rip currents, and face-burning duck dives. Tuesdays are a long work day for me normally, but I was able to sneak out for a late afternoon session before the sun went down. 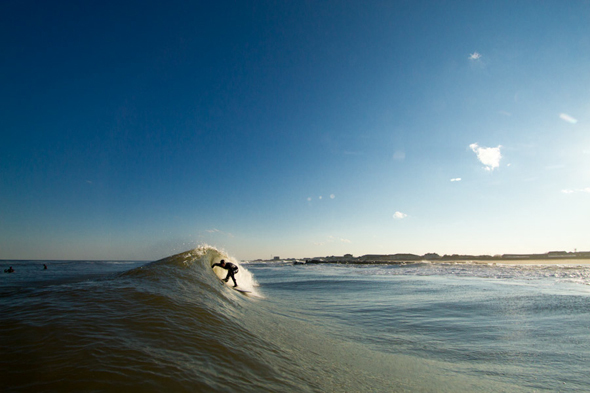 The flood of photos on the internet that day have me believing the better part of the swell hit more southern beaches. 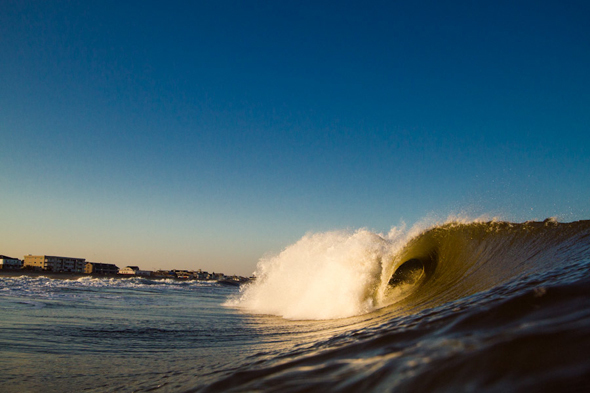 We still had some good ones in Bradley Beach, although some of the angles on the waves were weird with the mixed swell direction. Photographer Christor Lukasiewicz from Long Branch caught up with us to get a few shots before the day was over. Winter’s last cold kiss, it was a sweet one to say the least. I saw Mike Hughes get this wave as I was paddling back out. Here is the moment before a long and perfectly executed barrel ride. I was confident on the take off, but a slight miscalculation of timing on my part. Winter’s about to show me no mercy. Squeezing into a small inside bowl. At this point, my feet felt like solid ice. 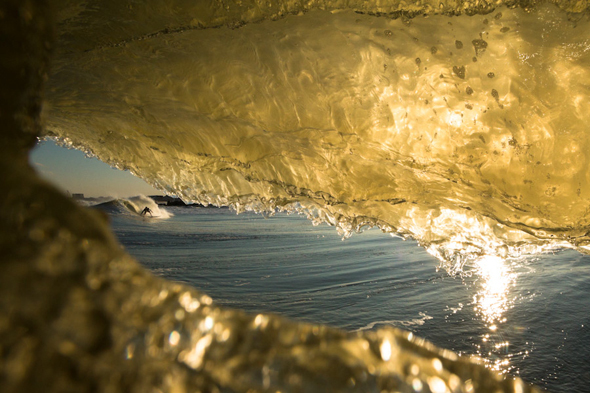 Photo at top: Catching a glimpse of Mike Hughes down the beach through the eye of another wave. 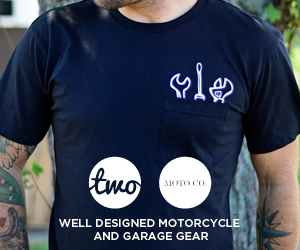 This entry was posted on Friday, March 22nd, 2013 at 5:11 pm. It is filed under SURF. You can follow any responses to this entry through the RSS 2.0 feed.